This text is for Introductory Electrical Engineering, or capstone design courses. It is also appropriate for Electrical Technology Robotics courses. 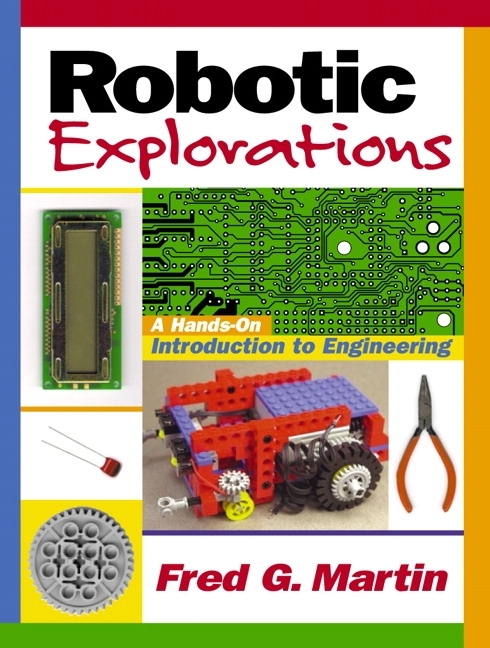 This hands-on, introductory book is based on widely available, custom robotics materials (Handy Board, Interactive C, LEGO Technic). Faculty can establish hands-on, intro-level engineering design courses. Text is based on widely available, custom robotics materials (Handy Board, Interactive C, LEGO Technic). Feedback Control, Cybernetics, and Robotics. Toys To Think With. About the Technology. An Overview of the Book. Interactive C and the Handy Board. The HandyBug. A First Program. Braitenberg Vehicles. Light and Touch Sensitivity. Randomness. Emergence and Meta-Sensing. Conclusion. Sensor Interfacing. Building Sensors. Switch Sensors. Light Sensor Circuits. Resistive Position Sensors. Reflective Optosensors. Break-Beam Sensors. Shaft Encoding. 4. Motors, Gears, and Mechanism. DC Motors. Gearing. Electronic Control. The Servo Motor. LEGO Design. Simple Feedback Control. Proportional-Derivative Control. Sequential Control. Reactive Control. Conclusion. Quadrature Shaft Encoding. Infrared Sensing. Ultrasonic Distance Sensing with the Polaroid 6500. Optical Distance Sensing with the Sharp GP2D02. Sensor Data Processing. A. Inside the Handy Board Design. Introduction to Microprocessors and the 68HC11. Introduction to Assembly Language Programming. The 68HC11 with the Handy Board Hardware. The AS11 Assembler. Differences between A and E Series 68HC11 CPUs. DC Motor. Servo Motors. Infrared Sensor and Transmitter. LEGO Adapter Cables. C. Serial Communications and Data Collection. Serial Line Interaction. Connecting to a Terminal Program. Printing to the Serial Line. Capturing Data. Specifications. Ports and Connectors. Battery Maintenance. Part Listing. Printed Circuit Board Layouts. Quick Start. 6811 Downloaders. Interactive C.
Introduction. Sample Contests. Contest Rule Analysis. Conclusion.